In 2005 I led the Ordination Retreat for the Ely Diocese. I drew the title for my addresses from Henri Nouwen’s book The Living Reminder, three lectures about the spiritual resources of ministers. What is it, asked Nouwen, that enables them to preach, teach, counsel and celebrate with a continuing sense of joy, wonder, gratitude and praise? His answer is to picture the minister as a ‘living reminder’, one whose life points to God and who heals, sustains and guides the people of God. At the end of the book he recalls how he realised that he had, in fact, discussed the minister using the familiar threefold pattern of pastor, priest and prophet. Following Nouwen’s theme, the addresses reflect on what it means to be a pastor, priest and prophet in today’s world, and I explore this using the symbols that we use in our ministry , the ordinary things of life that we endow with special significance and which become effective signs of the grace of God. The text of the addresses is available here. Read now. Every three years, or so, I lead a week of refection at Tournay Abbey in the Hautes Pyrénées, combining quiet time at the Abbey with visits to places of interest in the area. Details of the next visit will be posted as soon as they are available. The Abbaye Notre-Dame de Tournay, nestling by the river Arros in the glorious foothills of the Pyrenées, is a Benedictine community founded just over 50 years ago. 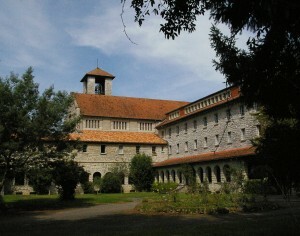 Like all monasteries it is a holy place, hallowed by prayer and the rhythm of the monastic life. The warm welcome, the peace and quiet, and the beautiful liturgy provide space for the spirit and make it the perfect place to take some time out. The surrounding area is rich in natural beauty with many places of pilgrimage and is noted for its Romanesque Churches. What is a home-based retreat? – who would like to deepen their prayer-life. 1. Clear the diary as much as possible for the week. 2. Set aside each day two times for silent prayer of half-an-hour to an hour, one in the morning, the other in the afternoon. 3. Meet for half-an-hour each day with one of the retreat conductors to talk over their experience. 4. Come to the service that concludes the retreat. Will there be anything to read? As there are no addresses in a home-based retreat, it is a good idea for a short book or set of meditations to take their place, like my Lent book, The Life Hidden with Christ in God.